When I was young, my family always visited The Apple Barn Cider Mill and General Store in Sevierville, TN. We even have a great family story about how I ran straight into a pole while walking into the store. It’s a hoot. Anyway, that is when my love for apple butter began. Ever since, I have loved having toast with peanut butter and a little apple butter on top. When we found out that my oldest has a peanut allergy, I had to come up with some creative ways to use my apple butter. So for national donut day, I give you Spice Apple Butter Donuts with an optional maple glaze. They go great together or apart. It’s a pick your own ending story! Preheat the oven to 350 degrees. Spray donut pans with cooking spray. Melt butter in a pan and allow to cool. In a large bowl, whisk flour, baking powder, baking soda, cinnamon, nutmeg, cloves, and salt. In another bowl, whisk egg, apple butter, milk, vanilla, and melted butter. Be sure that the butter is cool - you don’t want it scrambling the egg. Once combined, whisk in the brown sugar. Slowly add the wet ingredients to the dry and stir until combined. Bake for 10-12 minutes. When a toothpick inserted in the center comes out clean, they are baked. Remove from pan after 5 minutes. While they are cooling a bit, make the glaze by melting butter and maple syrup in a pan. Vigorously, whisk in powdered sugar. Dip donuts into glaze and allow to set. Enjoy warm if you can! They’re good for two days in an air tight container or up to two months in the freezer. Let’s all just take a moment and give an air high five (Jim + Pam style for you Office fans) to the inventor of the crockpot. I make at least one meal a week in my crockpot that usually covers dinner for two nights and lunch for at least one. This recipe could feed a small army, so keep that in mind. 1/2 it if you’re unsure. I had a standard size crock pot and it is filled to the brim. This week, I’m working on some warm, hearty, meaty (terrible word) crockpot chili with my sous chef. Damn, he is good at stirring. This is a great recipe to keep in the back of your mind and stock up when you see that some of the canned ingredients are BOGO. Depending on how liquidy you prefer your chili, you can drain the cans of diced tomatoes. While most millennials are welcoming fall becuase they can finally have their God-forsaken Pumpkin Spice Lattes, I’ve over here excited to carve pumpkins and trick or treat! I love Halloween. It is my favorite gift-free holiday. (Let’s be honest, I like me some presents.) 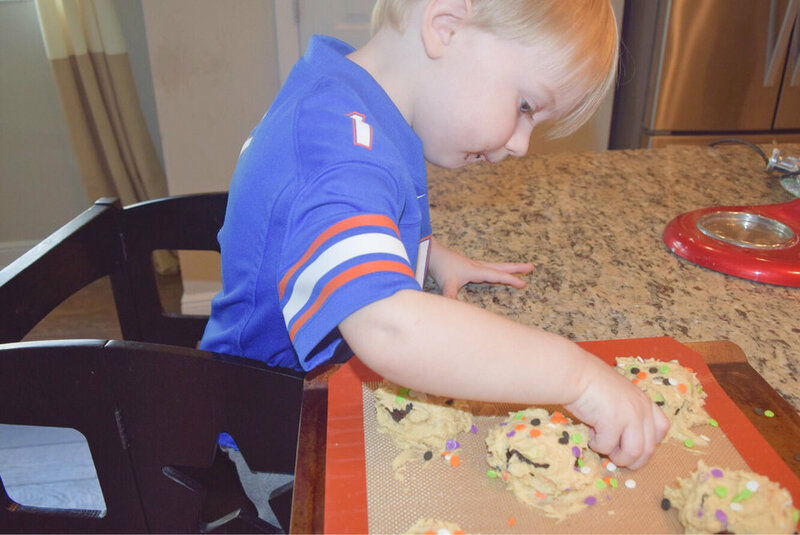 I love coming up with costume ideas, watching Halloween movies, and baking spooky treats with my sous chef, Brooks. Brooks is at the perfect age to help. We count A LOT and pracitce pouring. Plus, he always gets to taste test so he’s a happy camper. 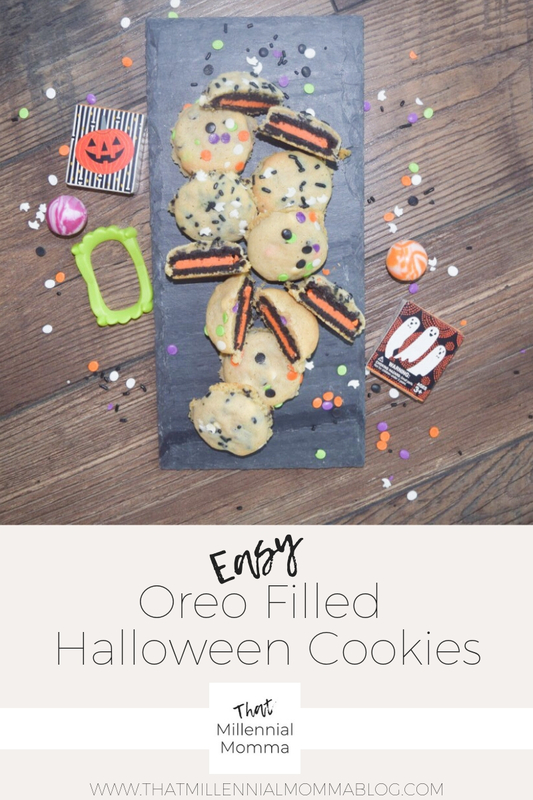 I came across Halloween Oreos at Target the other day which I scooped up instantly. I also grabbed some Wilton Halloween sprinkles, and let my imagination run away! Since Brooks can only focus for so long, I grabbed the original Nestle Tollhouse cookie recipe sans chocolate chips, and we went to town! Before I get into the how-to, let me start with a disclaimer. These bad boys did not come out of the oven looking great. The cookies spread and the Oreo part was a giant blemish in the center. However, I baked them perfectly so that the surrounding cookie could easily be trimmed to leave nice round cookies. And plenty of scraps for mom and dad. Beat butter, granulated sugar, brown sugar and vanilla extract in mixer bowl until creamy. Add eggs, one at a time, beating until fully incorporated after each addition. Stir in sprinkles. We divided the batter in half and did two different kinds of sprinkles that the sous chef painstakingly selected. Drop dough by tablespoon onto baking sheets. (I used silicone liners, which may be part of the reason I had so much spreading. Try an ungreased sheet if you don’t have the liners!) Put an Oreo in the center of the dough and push down gently. Drop about 1/2 tablespoon of batter on the Oreo. Use your fingers to completely cover the Oreo with the batter. Bake for 9 to 11 minutes or until golden brown on the edges and chewy in the center. Cool on baking sheets for 2 minutes; trim any excess. Remove to wire racks to cool completely. Roughly 12-15 covered Oreos with a little left to eat raw. I know it’s not good for your body, but its good for the soul! Now that Vance (8 months) is venturing out into table foods, I have to think about how I can translate one meal into something that a toddler will try, a baby will be able to gum, and that will pair nicely with a beer once the littles are asleep. Below are 3 meals that I always have on repeat because they are so versatile. The ingredients can easily be amended based on dietary restrictions or the toddler protest of the week. Most of these ideas have a decent amount of ingredients, but whenever possible (and still remotely healthy) I will buy canned or frozen items to cut prep time down. Usually the kids versions are much faster to prep since toddlers seem to go from content to I'M STARVING AND I'M GOING TO DIE in 3 seconds. Taco Seasoning - Since this is a weekly item, we buy the huge one at Costco. Saves a few bucks. Or make your own. Here is a simple recipe using spices that you likely already have. I assume we all know how to make tacos, so I'm not going to belittle you by explaining that. You do you - just don't add cilantro, that's gross. How to for Toddler: Deconstruct everything. Right now, nothing on my toddler's plate can touch another item except for greek yogurt. His plate usually has tortilla shells, protein, corn, chopped avocado, and blue chips with greek yogurt. 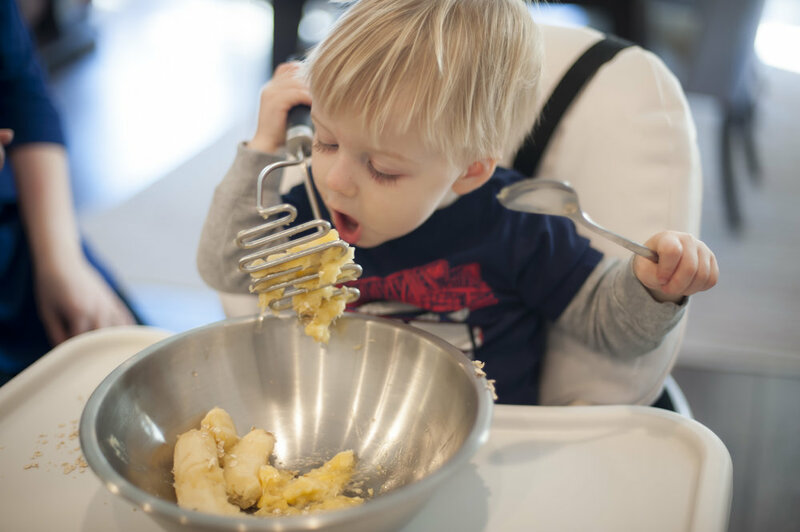 How to for Baby: Get that paring knife out! We do the black beans for the protein, cheese for the fun, and avocado so that we make a huge mess. Chop everything into teeny pieces. Variations for the rest of the week: Nachos! Chips become the base and throw everything on top! Helpful tools: Taco stand - Make those tacos Instagrammable! That donut was from an adventure in "offering dessert with the meal to deglamorize it". It went so-so. My husband and I usually opt for this Chipotle Chicken variety with a few adaptations, and we keep it simple for the kiddos. Again, mixing and touching ingredients is not flying in our house. How to for Adults: Preheat oven to 400 degrees. Season chicken with salt and pepper, and cook in olive oil until thoroughly cooked. Top Naan with shredded cheese, diced red peppers, and bacon pieces. Pop that in the oven for 5-8 minutes just to melt the cheese and warm everything. While that cooks, combine equal amounts of greek yogurt and rmayo with a few tablespoons of taco seasoning (to taste) for a simple chipotle-esque dressing. Throw that concoction in a ziploc bag. Seal with no air inside and snip a corner. Drizzle the dressing on the warm flatbread, add the chopped avocado, and enjoy! How to for Toddler: Preheat oven to 400 degrees. Spoon marinara sauce on to Naan. Sprinkle cheese on top. (If your toddler enjoys any particular veggies, add those now.) Pop in the oven until warm and the cheese melts. Serve with some of the chicken from the adult version or some fruits and veggies. How to for Baby: Shred the chicken to baby size and serve with pieces of avocado and some greek yogurt for protein. Remember how we all thought breakfast for dinner was such a treat as a kid? The reason parents opt for this is because it is easy and usually doesn't result in tears. Childhood memories ruined! Sausage or Bacon (whatever is on sale) I like the kind that you microwave, its easy and tastes the same. How to for Adults and Toddler: Double whammy here! Prep pancakes or waffles according to the directions on the box. Ditto with the sausage and bacon. I am not opposed to using the griddle for the bacon then cooking the pancakes on that same griddle. Honestly, I don't really even remember how to do anything to eggs other than scramble so this one is user's choice! And if all that fails, its ice cream for dinner, and we'll try again tomorrow! Once this behavior became a trend rather than a rare occurrence, I decided that hiding veggies into foods that he liked was the only option. Baking seemed like the safest place to start, so without further ado I give you Monster Muffins! 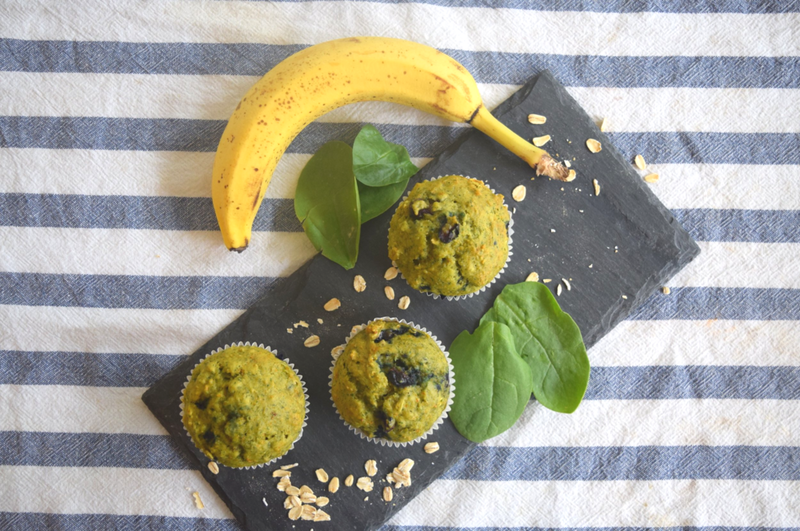 These shockingly tasty (and predictably unappealing looking) muffins include spinach, carrots, bananas, and blueberries with only optional added sugar. And you can do most of the hard work in a food processor or blender so it is easy clean up too! 2. Melt the butter and leave to cool. 3. Combine the dry ingredients - All Purpose Flour, baking soda, baking powder, salt, cinnamon (optional)- in a large bowl. Whisk together. 4. Place spinach and carrots into a blender or food processor and blend or pulse until the vegetables are pulverized. Add the remaining wet ingredients- milk, honey, applesauce, vanilla, banana, and optional brown sugar- and the cooled melted butter to the vegetable mixture, and blend until combined. 5. Slowly pour the wet mixture into the dry ingredients stirring to combine as you go. Do not over stir. 7. Bake for 20-25 minutes until a toothpick inserted in the center comes out clean. As you can see, Brooks loves bananas. He also loves his carbs, so banana bread is a no-brainer in our house. I was jealous watching the rest of the family enjoy banana bread while I'm dairy free (while nursing Vance). 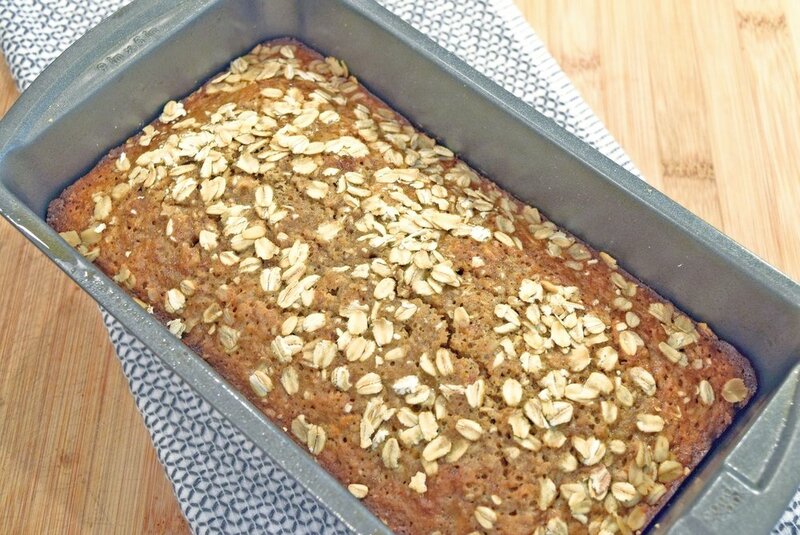 So I mixed and matched some recipes to create this dairy-free banana oat bread recipe. This does make a very dense bread, so if you are looking for light and fluffy, this is not the right recipe for you. Mash up 3 bananas (or have your toddler do so). Combine the bananas, olive oil, eggs, and brown sugar and whisk until well combined. Add the flour, cinnamon, and oats to the wet mixture. Stir until combined. I'm always looking for ways to change up recipes since Brooks's tastes change hourly. How did you remix this recipe to better suit your family? !